For a touring production, fifteen is a generously large cast. I’ve seen it done with fewer. From Salisbury, it goes on for eight more theatres. Salisbury Playhouse was 25% full? Maybe 30%? We’re used to crowded matinees at Salisbury. The Novochock poisoning took place a few hundred yards away from Salisbury Playhouse. We’ve sat and had sandwiches on the actual bench. The event was just over a year ago. As we drove into Salisbury, signs for the Old George Mall car park showed 130 empty places at noon. It used to be full. The Central Car Park near the theatre had lots of spaces. Our favourite Indian restaurant was about empty rather than packed. The assassins seem to have comprehensively screwed Salisbury, even a year on. Local tales of a 25% drop in city centre business seem an understatement. The theatre foyer clock said the play was 2 hours 30 minutes long including an interval. It started at 14.15 and ended at 17.05. I make that 2 hours 50 minutes including an interval, and given that the production is at its third venue, and a month in, you’d think they’d know the length by now. Twenty minutes is a spectacular margin of error. The seats at the sides where we were, are cheaper, evidenced by a large block of empty seats down the middle. The school party, which always enlivens matinee comedies, was a long way back from the stage. I’ve spoken to actors about matinees, especially under-attended matinees like this with a retiree audience. It’s not motivating. The text was taken far too fast by several of the cast – when you’re learning Shakespearean lines they’re easier if you do it fast, and later learn to pace it slower. Sadly, what we got here was often “matinee gabble” as if racing for the end – it was particularly true in the early scenes. I’ve adapted this play as an English Language Teaching graded reader. I did it for A level. I know it extremely well, which is the only way I managed to keep up with the pace early on. Robin Simpson, brilliant later, was one of the worst high-speed culprits early on. It was as if he knew he had great scenes coming and wanted to get through the early banter. Hero was another especially in the Beatrice overhearing scene, and also suffered from poor projection. I suspect it’s all better in evening performances especially later in the week with bigger audiences. That shouldn’t be. I was also surprised at what they didn’t cut in lines. Given the added music, and extra running time, several easy cuts were missed. The setting is at the end of World War II. That immediately references the Mark Rylance directed version at the Old Vic in 2013. That had US airmen returning to their English base, conceptually a fine idea, but it was a disaster because James Earl Jones as a geriatric Benedick was totally past it. A dull brown set didn’t help. This time, it’s the RAF rather than the USAF (thankfully, as American accents are always an issue with a British cast). Having said that, Northern Broadsides speciality is sticking to Yorkshire accents. I like consistency rather than random “whatever you feel like” accents, but I thought the universal West Yorkshire made everything blend together too much. Richard J. Fletcher as Don John. Heather Phoenix as Conrade. The first Dad’s Army reference has the evil Don John (Richard J. Fletcher) as a short and resentful ARP (Air Raid Precautions) warden next to the smart RAF pilots’ uniforms of his much taller brother, Don Pedro (Matt Rixon), and Benedick and Claudio. In Dad’s Army the officious ARP Warden Hodges was always the outsider. Conrade becomes female, which looks good in the earlier scenes with Don John (above) but stretches a tad when The Watch arrest the plotters, Borachio and Conrade. Not a bad stretch though. It worked. 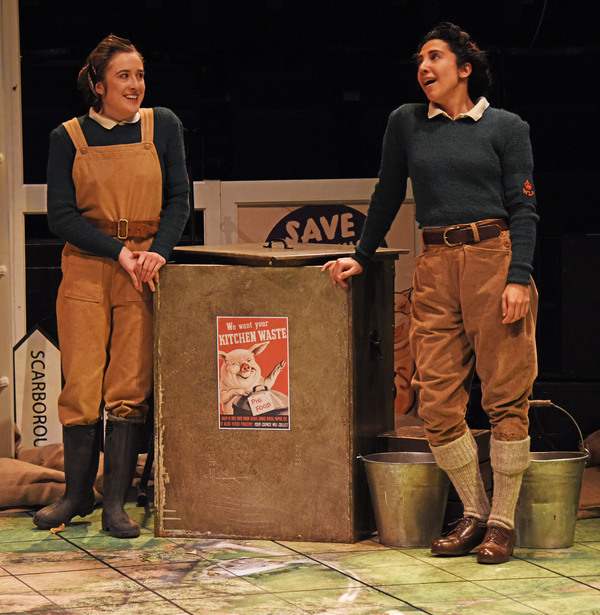 The women are Land Girls, or Women’s Land Army, from World War Two, with the task of collecting pig swill in buckets. The set is littered with roadsigns (virtually all Yorkshire) and in World War II, road signs were taken down in case of invasion. Certainly that happened in the South, though one wonders if it spread up to Yorkshire. When the Watch appear, they’re a Dad’s Army mismatch, with Dogberry as a short Captain Mainwaring and his assistant as a tall limp-wristed sergeant. While Sergeant Wilson was slightly camp, this Sergeant (Verges) was played outrageously, like Kenneth Williams poncing about in a Carry On film. The Watch have an excellent physical routine every time “The Prince” is mentioned. It’s just like the routine we used to do in ELT stage shows with a funny Latin American firing squad lined up to shoot “El Presidente” who saluted and shouted Viva El Presidente! everytime his name was mentioned. I don’t know where we got it from, but it’s a tried and tested routine. The addition here was the sergeant ending up with hand on hip and pouting. The music is of the period, referencing The Andrews Sisters at the start with Don’t Sit Under The Apple Tree With Anyone Else But Me opening the play. There was more music in the first half than the second and many of the cast played instruments. the Shakespeare sonnet Sigh No More was in the style of The Ink Spots. Andrew Whitehead as Antonio on violin and Sophia Hatfield as Margaret on reeds (sax, clarinet) stood out. That reminded me of the last three Shakespeare productions at The Watermill with music, but those had a younger cast and a sense of pace, vigour and snap that this somehow lacked. Linford Johnson as Claudio, Isobel Middleton as Beatrice, Robin Simpson as Benedick. The production goes for Benedick and Beatrice as middle-aged, but avoids the excess of Rylance’s extreme elderly. I thought giving Antonio (Andrew Whitehead) a dog collar, and therefore enabling him to double as the priest was a very good idea that is worth future imitation. No reason Antonio shouldn’t be a vicar as well as Leonato’s brother. 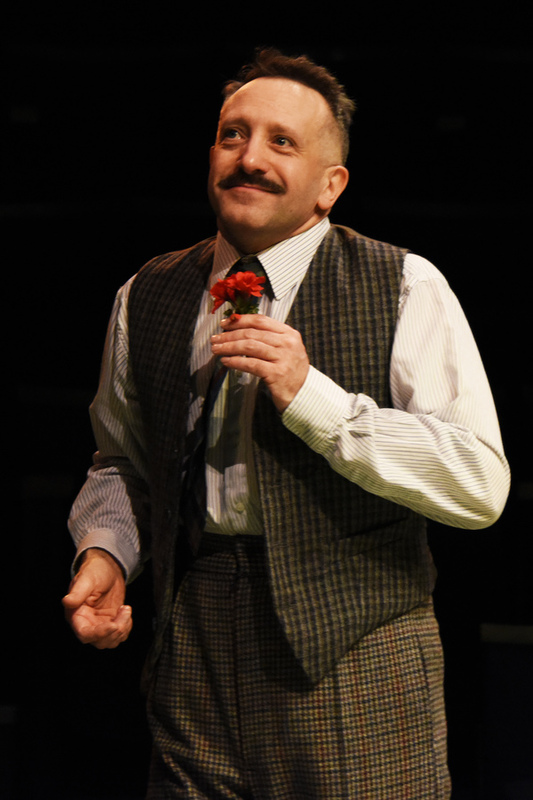 The play relies on Benedick and Beatrice and they were the central strength. 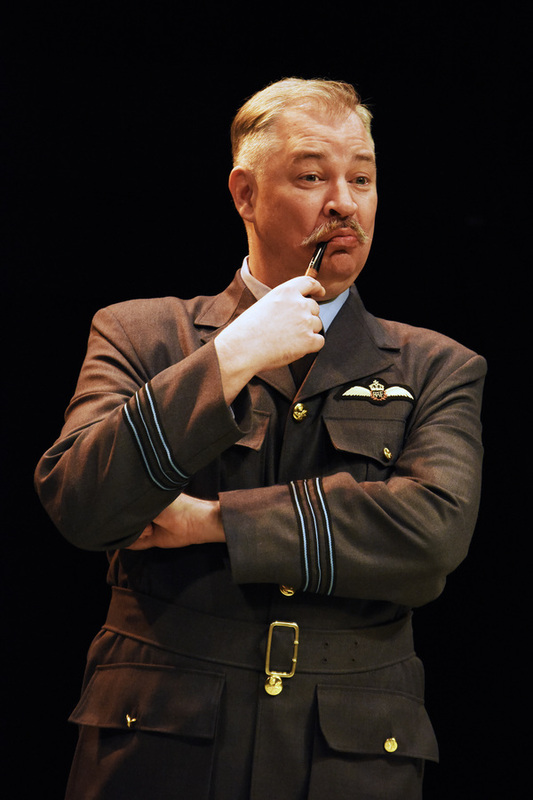 Robin Simpson with his regulation hair cut and moustache looked every inch the RAF man, and took the overhearing scene and the later scenes with Beatrice brilliantly. 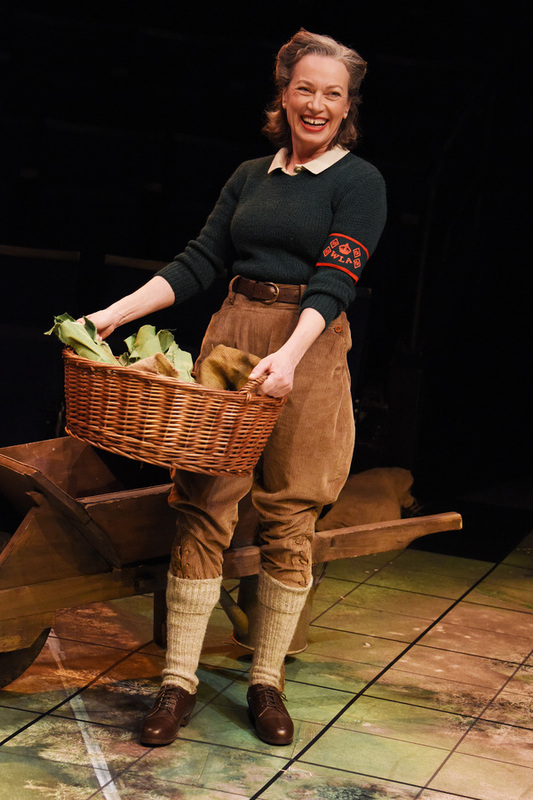 Isobel Middleton, in unglamorous dungarees and gum boots was a perfect foil. 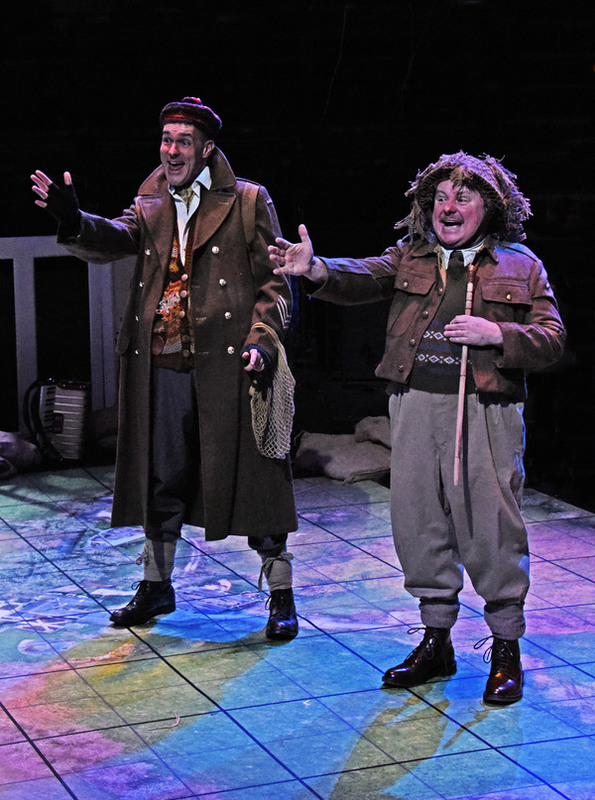 Both the “overhearing” scenes had good business.We both noted that bits of Benedick’s business, scrabbling along the front row to hide, and Beatrice’s business, hiding in the pig swill skip with unfortunate results, both appeared in the RSC’s Merry Wives of Windsor in 2018. Ursula (Rachel Hammond) and Hero (Sarah Kameela-Impey). Guess where Beatrice is. There was an added “Cinderella” silent subplot sequence involving Beatrice’s gumboot which was a highlight – and one of the biggest laughs when resolved. The gardener, dispensed to search for Benedick’s boot, had a few good “step outside the play” and moan as an actor lines. No plot spoilers. I laughed. I laughed quite a lot throughout actually … though I was surprised at how quiet the mainly silver-haired audience was. 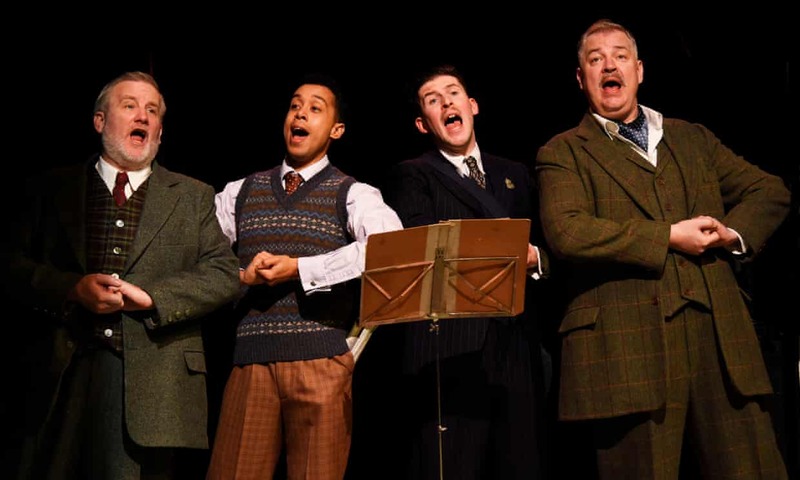 I would have expected much more hilarity, and judging from 4 star reviews of the New Vic and 5 star reviews of Scarborough, it had the audiences there rolling in the aisles. I’m very surprised they didn’t get more audience reaction in Salisbury on a grey afternoon. The costume is five star, the high number of costume changes is probably over-spending in this area though. To me, the direction looked focussed on excellent comic business and choreography, but under-focussed on detailed spoken line direction and work. Hence the matinee gabble, and in some cases weak line interpretation. Both Claudio and Hero looked very young. Her delivery was too soft, and while he worked hard, he looked weedy next to the rest of the cast. You couldn’t believe he could respond to Benedick’s challenge. Too many older blokes with moustaches. I wondered about the stage … they started in the New Vic in Newcastle-under-Lyme and moved onto the Stephen Joseph Theatre in Scarborough. Both are in the round theatres. Maybe they’re still adjusting to working on a proscenium stage. 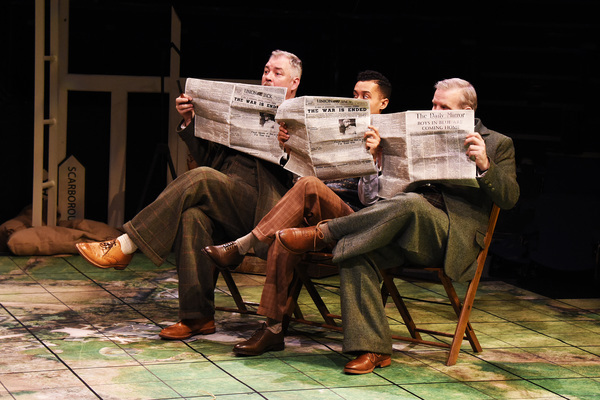 I can see four star aspects, I can see good ideas abound and this 1945 from the New Vic worked far better than Rylance’s 2013 view of 1945 from the Old Vic … but on a Thursday afternoon matinee with gabbled lines, this only merits three at most. I’m sure they have done it better on other days. Definitely worth seeing. They can credit bar staff at various theatres in the programme, but not the writers of the songs performed in the play. Appalling. The opening production number at length is Don’t Sit Under The Apple Tree, as performed by The Andrews Sisters and Glen Miller. It was written by Sam H. Stept with lyrics by Lew Brown and Charles Tobias. I consider their 3 to 4 minute contribution to the play greater than at least fifty of those listed in the programme. I think Jealousy as sung by Matt Rixon as Don Pedro is the Frankie Laine hit. The three best theatres in the South outside London are Bath Theatre Royal, Salisbury Playhouse and Chichester Festival Theatre. Salisbury Playhouse has been consistently good for years. It’s not only the Novochok aftermath causing problems with audience size. We looked at lobby adverts and saw three or four plays we were interested in. Then we drove back to what will be from April 1st(no joke) “BCP” the only town in this country which is merely initials. On that date Bournemouth, Christchurch and Poole become one authority. Some planner may have thought that BCP would have the ring of LA, NYC or NOLA. Think again. Anyway, the main A338 road into BCP has had roadworks for months, strangling Bournemouth town centre. Coming back from Salisbury’s matinee, it took us 48 minutes to get through them. No one was working there at 18.30. We abandoned thoughts of another matinee while they’re still on. Recently, it took us 35 minutes in roadworks in Southampton because of the huge roundabout closure (ongoing). 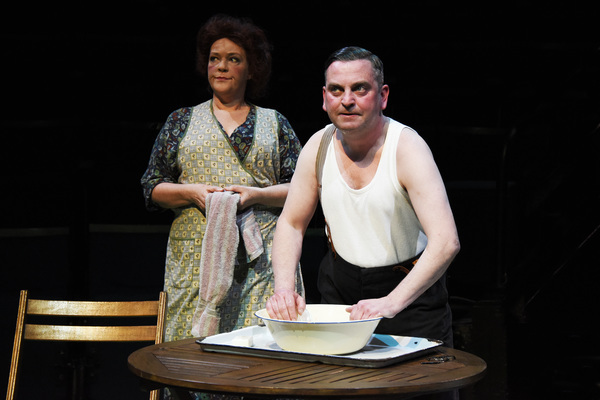 We know that many people from BCP and Southampton travel to Salisbury Playhouse. Diminishing audiences in Salisbury (a butterfly flaps its wings …) is the sort of knock-on effect that these never-ending roadworks with excessive road closures has.